Compute! 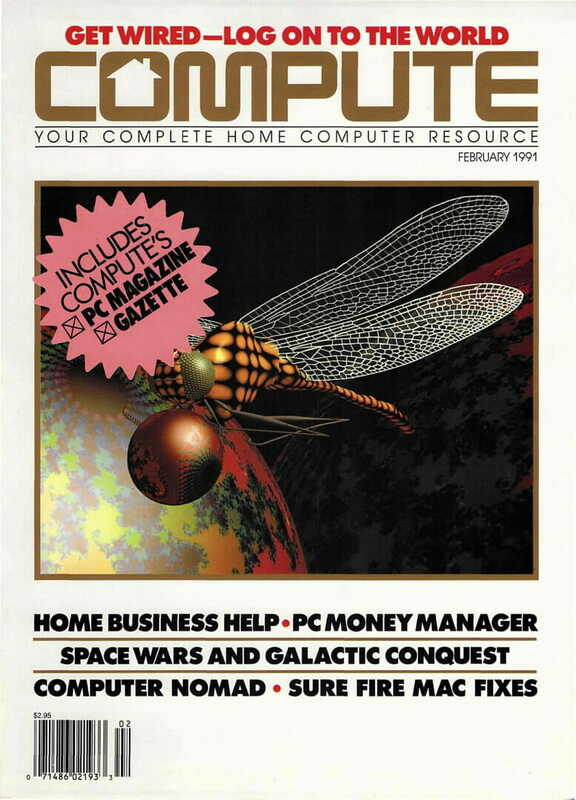 was published from 1979 through 1994, covering all platforms until becoming a PC-only publication in 1988. The link at the beginning of that sentence will take you to a much more substantial history of the magazine, including full text of many articles. 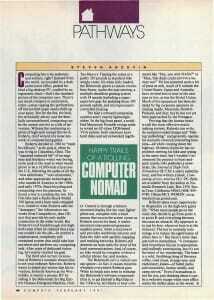 I was saddened to learn just now that the author of this piece, Steven Anzovin, passed away in 2006. Computing has to be sedentary and solitary, right? Isolated from the world, surrounded by a drab partitioned office, parked behind a big desktop PC, cradled by an ergonomic chair—that’s the standard picture of the computer user. There’s not much romance or excitement, either, unless ripping the perforations off tractor-feed paper sends chills up your spine. But for the few, the bold, the technically adroit, and the familially unencumbered, computing can be the central activity in a life of adventure. 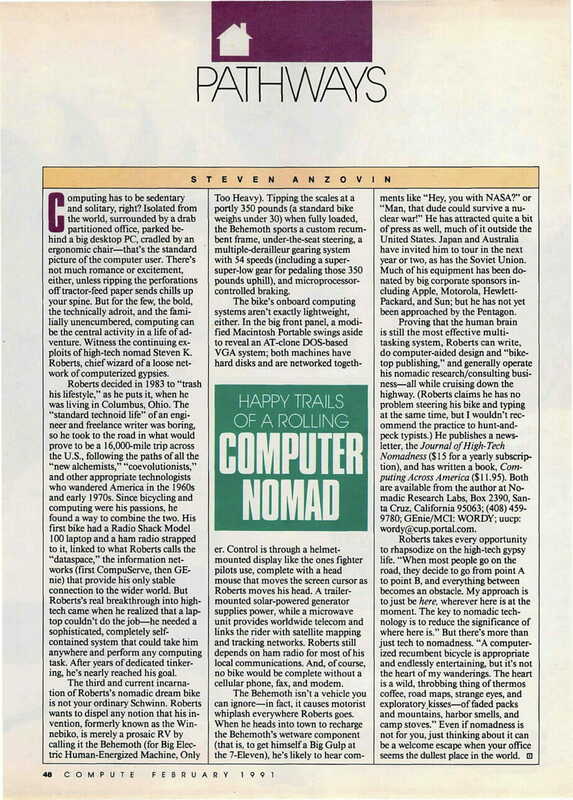 Witness the continuing exploits of high-tech nomad Steven K. Roberts, chief wizard of a loose network of computerized gypsies. Roberts decided in 1983 to “trash his lifestyle,” as he puts it, when he was living in Columbus, Ohio. The “standard technoid life” of an engineer and freelance writer was boring, so he took to the road in what would prove to be a 16,000-mile trip across the U.S., following the paths of all the “new alchemists,” “coevolutionists,” and other appropriate technologists who wandered America in the 1960s and early 1970s. Since bicycling and computing were his passions, he found a way to combine the two. His first bike had a Radio Shack Model 100 laptop and a ham radio strapped to it, linked to what Roberts calls the “dataspace,” the information networks (first CompuServe, then GEnie) that provide his only stable connection to the wider world. But Roberts’s real breakthrough into high-tech came when he realized that a laptop couldn’t do the job—he needed a sophisticated, completely self-contained system that could take him anywhere and perform any computing task. After years of dedicated tinkering, he’s nearly reached his goal. The third and current incarnation of Roberts’s nomadic dream bike is not your ordinary Schwinn. Roberts wants to dispel any notion that his invention, formerly known as the Winnebiko, is merely a prosaic RV by calling it the Behemoth (for Big Electric Human-Energized Machine, Only Too Heavy). Tipping the scales at a portly 350 pounds (a standard bike weighs under 30) when fully loaded, the Behemoth sports a custom recumbent frame, under-the-seat steering, a multiple-derailleur gearing system with 54 speeds (including a super-super-low gear for pedaling those 350 pounds uphill), and microprocessor-controlled braking. The bike’s onboard computing systems aren’t exactly lightweight, either. In the big front panel, a modified Macintosh Portable swings aside to reveal an AT-clone DOS-based VGA system; both machines have hard disks and are networked together. Control is through a helmet-mounted display like the ones fighter pilots use, complete with a head mouse that moves the screen cursor as Roberts moves his head. A trailer-mounted solar-powered generator supplies power, while a microwave unit provides worldwide telecom and links the rider with satellite mapping and tracking networks. Roberts still depends on ham radio for most of his local communications. And, of course, no bike would be complete without a cellular phone, fax, and modem. The Behemoth isn’t a vehicle you can ignore—in fact, it causes motorist whiplash everywhere Roberts goes. When he heads into town to recharge the Behemoth’s wetware component (that is, to get himself a Big Gulp at the 7-Eleven), he’s likely to hear comments like “Hey, you with NASA?” or “Man, that dude could survive a nuclear war!” He has attracted quite a bit of press as well, much of it outside the United States. Japan and Australia have invited him to tour in the next year or two, as has the Soviet Union. Much of his equipment has been donated by big corporate sponsors including Apple, Motorola, Hewlett-Packard, and Sun; but he has not yet been approached by the Pentagon. Proving that the human brain is still the most effective multitasking system, Roberts can write, do computer-aided design and “biketop publishing,” and generally operate his nomadic research/consulting business—all while cruising down the highway. (Roberts claims he has no problem steering his bike and typing at the same time, but I wouldn’t recommend the practice to hunt-and-peck typists.) He publishes a newsletter, the Journal of High-Tech Nomadness ($ 15 for a yearly subscription), and has written a book, Computing Across America ($11.95). Both are available from the author at Nomadic Research Labs [obsolete contact info redacted]. Roberts takes every opportunity to rhapsodize on the high-tech gypsy life. “When most people go on the road, they decide to go from point A to point B, and everything between becomes an obstacle. My approach is to just be here, wherever here is at the moment. The key to nomadic technology is to reduce the significance of where here is.” But there’s more than just tech to nomadness. “A computerized recumbent bicycle is appropriate and endlessly entertaining, but it’s not the heart of my wanderings. The heart is a wild, throbbing thing of thermos coffee, road maps, strange eyes, and exploratory kisses—of faded packs and mountains, harbor smells, and camp stoves.” Even if nomadness is not for you, just thinking about it can be a welcome escape when your office seems the dullest place in the world. Posted in Media - BEHEMOTH and tagged Compute!